It’s easy when you use HipChip"
“This was an awesome experience!! Cover Expenses. Buy Local Gifts. By clicking sign up, you are agreeing to our Terms and Conditions. The merchants represented are not sponsors of HipChip or otherwise affiliated with HipChip. The logos and other identifying marks attached are trademarks of and owned by each represented company and/or its affiliates. Please visit each company's website for additional terms and conditions. The HipChip Visa Gift Card is issued by MetaBank®, Member FDIC, pursuant to a license from Visa U.S.A. Inc. The HipChip Visa Gift Card may be used everywhere Visa debit cards are accepted. See Cardholder Agreement for details. *Amazon.com Gift Cards ("GCs") sold by HipChip Inc., an authorized and independent reseller of Amazon.com Gift Cards. Except as required by law, GCs cannot be transferred for value or redeemed for cash. GCs may be used only for purchases of eligible goods at Amazon.com or certain of its affiliated websites. For complete terms and conditions, see www.amazon.com/gc-legal. GCs are issued by ACI Gift Cards, Inc., a Washington corporation. All Amazon ®, ™ & © are IP of Amazon.com, Inc. or its affiliates. No expiration date or service fees. This E-Sign Disclosure and Consent (“Disclosure”), applies to all Communications for any Account offered through giftcards.omnicard.com that is not otherwise governed by the terms and conditions of an electronic disclosure and consent. The words “we,” “us,” and “our” refer to MetaBank®, Member FDIC, with whom you have your Account, and the words “you” and “your” mean you, the individual(s) or entity identified on the Account(s). As used in this Disclosure, “Account” means the account you have with us. “Communication” means any customer agreements or amendments thereto, disclosures, notices, responses to claims, transaction history, privacy policies and all other information related to the product or service, including but not limited to information that we are required by law to provide to you in writing. All Communications that we provide to you in electronic form will be provided either (1) via e-mail, (2) by access to a web site that we will designate in an e-mail notice we send to you at the time the information is available, or (3) to the extent permissible by law, by access to a web site that we generally designate in advance for such purpose. You may withdraw your consent to receive Communications electronically by contacting Customer Service at 844-234-9661 or writing to us at 10615 Professional Circle, Suite 102; Reno NV 89521. At our option, we may treat your provision of an invalid e-mail address, or the subsequent malfunction of a previously valid e-mail address, as a withdrawal of your consent to receive electronic Communications; however your access and use of giftcards.omnicard.com may be terminated. Any withdrawal of your consent to receive electronic Communications will be effective only after we have a reasonable period of time to process your withdrawal. If you withdraw your consent and we have your name and address, we will mail paper versions of all Communications to you at no additional cost. If you have withdrawn your consent and wish to receive electronic Communications again in the future, you may do so by contacting Customer Service at 844-234-9661 or writing to us at 10615 Professional Circle, Suite 102; Reno NV 89521. It is your responsibility to provide us with true, accurate and complete e-mail address, contact, and other information related to this Disclosure and your Account(s), and to maintain and update promptly any changes in this information. You can update information (such as your e-mail address) through giftcards.omnicard.com or by contacting us at 844-234-9661.
a personal computer (for PC’s: Pentium 120 MHz or higher; for Macintosh, Power Mac 9500, Power PC 604 processor: 120-MHz Base or higher), operating system and telecommunications connections to the internet capable of receiving, accessing, displaying, and either printing or storing Communications received from us in electronic form via a plain text-formatted e-mail or by access to our web site using one of the browsers specified above. We will not send you a paper copy of any communication, unless you request it or we otherwise deem it appropriate to do so. You can obtain a paper copy of an electronic Communication by printing it yourself or by requesting that we mail you a paper copy, provided that such request is made within a reasonable time after we first provided the electronic Communication to you. To request a paper copy, contact Customer Service at 844-234-9661 or write to us at 10615 Professional Circle, Suite 102; Reno NV 89521. We may charge you a reasonable service charge for the delivery of paper copies of any Communication provided to you electronically pursuant to this authorization. We reserve the right, but assume no obligation, to provide a paper (instead of electronic) copy of any Communication that you have authorized us to provide electronically. All Communications in either electronic or paper format from us to you will be considered “in writing.” You should print or download for your records a copy of this Disclosure and any other Communication that is important to you. By purchasing or using a card or Account from this site, you hereby give your affirmative consent to provide electronic Communications to you as described herein. You further agree that your computer satisfies the hardware and software requirements specified above and that you have provided us with a current e-mail address at which we may send electronic Communications to you. GIVE THIS DOCUMENT TO THE RECIPIENT OF THE GIFT CARD FOR ANY FUTURE QUESTIONS OR ISSUES. PLEASE READ CAREFULLY. THIS AGREEMENT CONTAINS AN ARBITRATION PROVISION (“DISPUTE CLAUSE” SECTION) REQUIRING ALL CLAIMS TO BE RESOLVED BY WAY OF BINDING ARBITRATION. ALWAYS KNOW THE EXACT DOLLAR AMOUNT AVAILABLE ON YOUR CARD. MERCHANTS MAY NOT HAVE ACCESS TO DETERMINE YOUR CARD BALANCE. IF YOU DO NOT AGREE TO THESE TERMS, DO NOT USE THE CARD. SAVE YOUR RECEIPT AND CANCEL THE CARD BY CALLING CUSTOMER SERVICE AND REQUESTING A REFUND CHECK. What is the Card and how do I use it? The Card is a Visa Gift Card that can be used to purchase merchandise and services anywhere Visa debit Cards are accepted in the United States. It is not redeemable for cash, except as required by law. It cannot be used at ATMs or for gambling. Additional restrictions may apply. We also suggest that you write down the Card number and Customer Service number from the back of the Card on a separate piece of paper in case the Card is lost or stolen. The amount of every purchase you make will automatically be deducted from the value on the Card. There are three ways you can keep track of your balance: visit giftcards.omnicard.com; call 844-234-9661 to make automated balance inquiries 24/7; or track your balance as you spend. Some retailers do not have access to the remaining balance on your Card. Do I need to register my Card for online, mail or telephone purchases? Yes, online, mail and telephone order merchants often require that personal information, including name, address, telephone number and email address of the cardholder be verified with the Card-issuing bank prior to purchase. If you wish to make online, mail or telephone order purchases, you should go to giftcards.omnicard.com to register your Card. Unless you register your Card in advance, there may be no way an online, mail or telephone order merchant can confirm your identity. Without such confirmation, the merchant might decline your purchase even if there are sufficient funds on the Card. Yes. If you do not use your Card for 12 consecutive months, we will charge a Monthly Maintenance Fee of $4.95 on the first day of each month that follows (starting with month 13) until you use the card again. At that point, we will wait until 12 more consecutive months of inactivity occur before charging the fee again. If you don’t use your Card for an extended period of time, these fees may lower or even exhaust the balance of your Card before the “valid thru” date has passed. You may avoid this fee by making regular purchases with your Card. There is also a Replacement Card Fee of $5 to replace a lost or stolen Card, so please safeguard your Card. This fee does not apply to replacement of an expired Card. Do the funds on my Card expire? No, the funds on your Card do not expire. Your Card will no longer work when the remaining value is equal to $0 or the “valid thru” date printed on the front of your Card has passed. If funds still remain on your Card after the “valid thru” date, please call 844-234-9661 to have a replacement Card with an updated “valid thru” date issued and mailed to you at no cost. The balance on the replacement Card will be equal to the balance on your discontinued Card. Can value be added onto my Card after it is purchased? No. Your Card is not reloadable. How can I earn money back by using my Card? When will my earnings be added to my Card balance? When you make a purchase at a participating merchant, your earnings will be added to your Card balance within 48 hours of your transaction posting. Will I earn more money back when I spend the money that has been added to the Card? What if my purchase is greater than the value available on my Card? You must advise the merchant how much is available on your Card. The merchant may complete a split tender transaction and charge the Card for the available balance. The remaining amount of your purchase would require another form of payment. Note that some merchants may not be able to perform split tender transactions. Can I use my Card at restaurants or other service industries when I have enough money left on my Card to cover the bill for food or service? Some restaurants and other service-oriented merchants may factor in an additional 20% (or more) to cover any tip you may leave on the purchase. If this occurs, and your total bill, after adding in the additional 20% (or more), exceeds the amount available on the Card, it will be declined. Accordingly, you may want to ensure that your Card has an available balance that is 20% (or) greater than your total bill prior to use. Similarly, some hotels chose to factor in additional amounts upon check-in, and it may take up to thirty days after your stay to have any excess amounts held by the hotel added back to your available balance. Can I use my Card to pay at the pump at gasoline stations? The ability to use your Card to pay at the pump will vary by merchant. We recommend that you prepay for gas inside at the register to avoid an authorization hold on your funds for more than the purchase amount. If my Card is lost or stolen, how do I report it? If your Card is lost or stolen, call the Toll-Free Customer Service Number at the top of these FAQ to cancel your Card as soon as you can. You will need to know your Card number, so be sure to record it in a safe place. You may also be required to provide additional information. If funds remain on your Card, we will send you a replacement Card, but a Replacement Card Fee of $5 will apply. When you shop at participating merchants, the Award Sponsor will add a certain percentage (up to 5%) of your purchase amount (including sales tax) to your Card balance. Visit giftcards.com/gift-cards-cash-back for a list of participating merchants and the money back percentage award offered by each merchant. The Award Sponsor will calculate earnings on a purchase‑by‑purchase basis and will round earnings amounts to the nearest whole cent (with amounts below half a cent being rounded down and amounts of half a cent or more being rounded up). Earnings generally will be added to your Card balance within 48 hours of the transaction posting. You can continue to earn money back until the balance on your Card is less than 10 cents. At that point, you will stop earning money back (because 5% of an amount less than 10 cents is less than half a cent, and the Award Sponsor rounds earnings to the nearest whole cent). If you return an item on which you earned money back, the Award Sponsor reserves the right to deduct the money you earned from your Card balance. * The 5% Back Bonus offer is provided by the Award Sponsor and is not provided or endorsed by MetaBank or Visa. Subject to applicable law, beginning on the 13th month after there has been no activity on your Card, a Monthly Maintenance Fee of $4.95 will be deducted from the funds associated with your Card. This fee will continue to be assessed as long as there are funds associated with your Card and no further activity has occurred. If further activity occurs, we will wait until the 13th consecutive month of inactivity to assess the Monthly Maintenance Fee. If you do not use your Card for an extended period of time, these fees may lower or even exhaust the balance of your Card before the “valid thru” date has passed. You may avoid this fee by making regular purchases with your Card. If your Card is lost or stolen, there will be a Replacement Card Fee of $5 to replace it. Although your Card has a “valid thru” date, the funds associated with your Card do not expire. When the “valid thru” date has passed, you must call 844-234-9661 to obtain a replacement Card at no cost. This Cardholder Agreement (“Agreement”) sets forth the terms and conditions under which a Visa Gift Card (“Card”) has been issued to you. The Visa Gift Card is a prepaid Card issued by MetaBank®, with certain services provided by Blackhawk Network California, Inc. By accepting and using this Card, signing the back of the Card, activating the Card, or authorizing any person to use the Card, you agree to be bound by the terms and conditions contained in this Agreement. In this Agreement "You" and "your" mean the person or persons who have received the Card and are authorized to use the Card as provided for in this Agreement. “We”, “us”, “our”, and “Bank” mean MetaBank, our successors, affiliates or assignees. You agree to sign the back of the Card immediately upon receipt. The Card will remain the property of Bank and must be surrendered upon demand. The Card is nontransferable after it has been signed, and it may be canceled, repossessed, or revoked at any time without prior notice, subject to applicable law. Please read this Agreement carefully and keep it for future reference. These terms and conditions apply to both the purchaser and any other user of the Card. It is the purchaser’s obligation to provide these terms and conditions to any user; however, new terms and conditions may be provided, or any other questions or concerns answered by contacting Customer Service. The Card is a prepaid Card loaded with a specific amount of funds, redeemable to buy goods and services anywhere Visa debit Cards are accepted. The Card is NOT a credit Card. The Card is not a checking account or connected in any way to any account other than a stored value account where your funds are held. You will not receive any interest on the funds in your Card account. If you have registered your Card, the funds in your Card account will be insured by the Federal Deposit Insurance Corporation (“FDIC”), subject to applicable limitations and restrictions of such insurance. You may register your Card by visiting the Website at giftcards.com/gift-cards-cash-back or calling the Toll Free Customer Service Number at 844-234-9661. You may not load additional funds to the Card. In case of errors or questions about your Card Account, telephone us at 1-877-944-3822, write us at 495 Mansfield Ave., Pittsburgh, PA 15205, as soon as you can, if you think an error has occurred involving your Card Account. We must allow you to report an error until sixty (60) days after the earlier of the date you electronically access your Card Account, if the error could be viewed in your electronic history, or the date we sent the FIRST written history on which the error appeared. You may request a written history of your transactions at any time by calling us at [Insert phone number] or writing us at 495 Mansfield Ave., Pittsburgh, PA 15205.
used for purchases where recurring payments may occur, such as subscriptions, memberships, rentals, etc. For security reasons, we may limit the amount or number of transactions you can make on your Card. We may refuse to process any transaction that we believe may violate the terms of this Agreement. Your card is valid in the U.S. only. It cannot be used at merchants outside of the United States, including internet and mail/telephone order merchants outside of the United States. Although your Card will not be accepted at locations outside of the United States, it is welcome at millions of locations within the U.S. everywhere Visa debit cards are accepted. You should keep track of the amount of value loaded on Cards issued to you. You may obtain information about the amount of money you have remaining in your Card account at no charge by contacting Customer Service. This information, along with a 60-day history of account transactions, is also available online by visiting our Website. You also have the right to obtain a sixty (60) day written history of account transactions by contacting Customer Service. Until you sign, you may present the Card to another person. If you do provide access to your Card or Card number, you are liable for all transactions made with the Card or Card number by those persons. You must notify us to revoke permission for any person you previously authorized to use Card information or have access to your account. You are responsible for all transactions and fees incurred by you or any other person you have authorized. You may wish to retain receipts as a record of transactions. Receipts will be required if you need to verify a transaction. If you do not have enough funds available in your Card account, you may be able to instruct the merchant to charge a part of the purchase to the Card and pay the remaining amount with another form of payment. These are called “split transactions.” Some merchants do not allow cardholders to conduct split transactions. Some merchants will only allow you to do a split transaction if you pay the remaining amount in cash. If you use your Card number without presenting your Card (such as for an internet transaction, a mail order or a telephone purchase), the legal effect will be the same as if you used the Card itself. Payment for pay-at-the-pump stations must be made inside. YOU ARE NOT ALLOWED TO EXCEED THE BALANCE OF THE FUNDS AVAILABLE ON YOUR CARD. If you attempt to use the Card when there are insufficient funds associated with it, the transaction will generally be declined. Nevertheless, if a transaction that exceeds the balance of the funds available on your Card occurs due to a systems malfunction or otherwise, you shall remain fully liable to us for the amount of the transaction. The funds on your Card do not expire. The "valid thru" date indicated on the front of your Card is not an expiration date, but is intended primarily for fraud protection purposes and also permits your Card to be used with certain internet or mail/telephone order merchants. After the "valid thru" date, your available funds will be temporarily unavailable until you contact Customer Service for a replacement Card with a new "valid thru" date. If your Card still has unused funds on it after your Card expires, you may order a new Card by contacting Customer Service. You will not be charged a replacement Card fee if you are ordering a replacement Card due to your Card expiring, in order to continue accessing unused funds. Please report any lost/stolen Cards immediately by calling Customer Service at 844-234-9661. Upon contacting us for any lost/stolen card, your funds will be temporarily unavailable until you activate your replacement Card. If your Card is lost or stolen, and you are calling for a replacment Card, you may be charged a Replacement Card Fee, as noted in the Fee Chart above. For purposes of these disclosures, our business days are Monday through Friday, excluding federal holidays. If you believe your Card has been lost or stolen or an unauthorized transaction has been made using the information from your Card without your permission, contact Customer Service IMMEDIATELY. We will ask for the Card number and other identifying details. We cannot assist you if you do not have the Card number. We reserve the right to investigate any claim you may make with respect to a lost or stolen Card or unauthorized transaction, and you agree to cooperate with such investigation. We may not be able to assist you if you do not contact us within 60 days of the unauthorized transaction. We will charge a Replacement Card Fee of $5 as noted in the fee table above to replace any lost/stolen Card, which will be deducted from the balance on the Card. A reissued Card may take up to 30 days to process. Under Visa’s Zero Liability Policy, your liability for unauthorized transactions on your Card Account is $0.00 if you are not grossly negligent or fraudulent in the handling of your Card. These provisions limiting your liability do not apply to debit transactions not processed by Visa. For any other exception stated in our Agreement with you. Your Card and your obligations under this Agreement may not be assigned. We may transfer our rights under this Agreement. Use of your Card is subject to all applicable rules and customs of any clearinghouse or other association involved in transactions. We do not waive our rights by delaying or failing to exercise them at any time (for example, assessing a fee less than described, or not all, for any reason does not waive our right to begin charging the fee as set forth in this Agreement without notice). If any provision of this Agreement shall be determined to be invalid or unenforceable under any rule, law, or regulation of any governmental agency, local, state, or federal, the validity or enforceability of any other provision of this Agreement shall not be affected. This Agreement will be governed by the laws of the state of South Dakota except to the extent governed by federal law. Should your Card have a remaining balance after a certain period of time, we may be required to remit the remaining funds to the appropriate state agency. We may monitor and/or record telephone calls between you and us to assure the quality of our customer service or as required by applicable law. We may amend or change the terms of this Agreement at any time, subject to applicable law. You will be notified of any change in the manner required by applicable law. However, if the change is made for security purposes, we can implement such change without prior notice. YOU AND WE ACKNOWLEDGE THAT THE RIGHT TO TRIAL BY JURY IS A CONSTITUTIONAL RIGHT BUT MAY BE WAIVED IN CERTAIN CIRCUMSTANCES. TO THE EXTENT PERMITTED BY LAW, YOU AND WE KNOWINGLY AND VOLUNTARILY WAIVE ANY RIGHT TO TRIAL BY JURY IN THE EVENT OF LITIGATION ARISING OUT OF OR RELATED TO THIS AGREEMENT. THIS JURY TRIAL WAIVER SHALL NOT AFFECT OR BE INTERPRETED AS MODIFYING IN ANY FASHION THE DISPUTE CLAUSE SET FORTH IN THE FOLLOWING SECTION, IF APPLICABLE, WHICH CONTAINS ITS OWN SEPARATE JURY TRIAL WAIVER. We have put this Dispute Clause in question and answer form to make it easier to follow. However, this Dispute Clause is part of this Agreement and is legally binding. What is arbitration? An alternative to court In arbitration, a third party arbitrator (“Arbitrator”) solves Disputes in an informal hearing. Is it different from court and jury trials? Yes The hearing is private. There is no jury. It is usually less formal, faster and less expensive than a lawsuit. Pre-hearing fact finding is limited. Appeals are limited. Courts rarely overturn arbitration awards. Can you opt-out of this Dispute Clause? Yes, within 60 days If you do not want this Dispute Clause to apply, you must send us a signed notice within 60 calendar days after you purchase the Card. You must send the notice in writing (and not electronically) to our Notice Address, Attn: General Counsel. Provide your name, address and Card number. State that you “opt out” of the dispute clause. What is this Dispute Clause about? The parties' agreement to arbitrate Disputes Unless prohibited by applicable law and unless you opt out, you and we agree that you or we may elect to arbitrate or require arbitration of any "Dispute" as defined below. Who does the Dispute Clause cover? You, us and certain "Related Parties" This Dispute Clause governs you and us. It also covers certain "Related Parties": (1) our parents, subsidiaries and affiliates; (2) our employees, directors, officers, shareholders, members and representatives; and (3) any person or company that is involved in a Dispute you pursue at the same time you pursue a related Dispute with us. What Disputes does the Dispute Clause cover? All Disputes (except certain Disputes about this Dispute Clause) This Dispute Clause governs all “Disputes” that would usually be decided in court and are between us (or any Related Party) and you. In this Dispute Clause, the word “Disputes” has the broadest reasonable meaning. It includes all claims even indirectly related to your Card or this Agreement. It includes claims related to the validity in general of this Agreement. However, it does not include disputes about the validity, coverage or scope of this Dispute Clause or any part of this Dispute Clause. (This includes a Dispute about the rule against class arbitration.) All such disputes are for a court and not an Arbitrator to decide. Who handles the arbitration? Usually AAA or JAMS Arbitrations are conducted under this Dispute Clause and the rules of the arbitration administrator in effect when the arbitration is started. However, arbitration rules that conflict with this Dispute Clause do not apply. The arbitration administrator will be either: • The American Arbitration Association ("AAA"), 1633 Broadway, 10th Floor, New York, NY 10019, www.adr.org. • JAMS, 620 Eighth Avenue, 34th Floor, New York, NY 10018, www.jamsadr.org • Any other company picked by agreement of the parties. If all the above options are unavailable, a court will pick the administrator. No arbitration may be administered without our consent by any administrator that would permit a class arbitration under this Dispute Clause. The arbitrator will be selected under the administrator's rules. However, the arbitrator must be a lawyer with at least ten years of experience or a retired judge unless you and we otherwise agree. Can Disputes be litigated? Sometimes Either party may bring a lawsuit if the other party does not demand arbitration. We will not demand arbitration of any lawsuit you bring as an individual action in small-claims court. However, we may demand arbitration of any appeal of a small-claims decision or any small-claims action brought on a class basis. Are you giving up any rights? Yes For Disputes subject to this Dispute Clause, you give up your right to: 1. Have juries decide Disputes. 2. Have courts, other than small-claims courts, decide Disputes. 3. Serve as a private attorney general or in a representative capacity. 4. Join a Dispute you have with a dispute by other consumers. 5. Bring or be a class member in a class action or class arbitration. We also give up the right to a jury trial and to have courts decide Disputes you wish to arbitrate. Can you or another consumer start a class arbitration? No The Arbitrator is not allowed to handle any Dispute on a class or representative basis. All Disputes subject to this Dispute Clause must be decided in an individual arbitration or an individual small-claims action. This Dispute Clause will be void if a court rules that the Arbitrator can decide a Dispute on a class basis and the court's ruling is not reversed on appeal. What law applies? The Federal Arbitration Act (“FAA”) This Agreement and the Cards involve interstate commerce. Thus, the FAA governs this Dispute Clause. The Arbitrator must apply substantive law consistent with the FAA. The Arbitrator must honor statutes of limitation and privilege rights. Punitive damages are governed by the constitutional standards that apply in judicial proceedings. Will anything I do make this Dispute Clause ineffective? No This Dispute Clause stays in force even if: (1) you or we end this Agreement; or (2) we transfer or assign our rights under this Agreement. What must a party do before starting a lawsuit or arbitration? Send a written Dispute notice and work to resolve the Dispute Before starting a lawsuit or arbitration, the complaining party must give the other party written notice of the Dispute. The notice must explain in reasonable detail the nature of the Dispute and any supporting facts. If you are the complaining party, you must send the notice in writing (and not electronically) to our Notice Address, Attn: General Counsel. You or an attorney you have personally hired must sign the notice and must provide the Card number and a phone number where you (or your attorney) can be reached. A letter from us to you will serve as our written notice of a Dispute. Once a Dispute notice is sent, the complaining party must give the other party a reasonable opportunity over the next 30 days to resolve the Dispute on an individual basis. How does an arbitration start? Mailing a notice If the parties do not reach an agreement to resolve the Dispute within 30 days after notice of the Dispute is received, the complaining party may commence a lawsuit or an arbitration, subject to the terms of this Dispute Clause. To start an arbitration, the complaining party picks the administrator and follows the administrator's rules. If one party begins or threatens a lawsuit, the other party can demand arbitration. This demand can be made in court papers. It can be made if a party begins a lawsuit on an individual basis and then tries to pursue a class action. Once an arbitration demand is made, no lawsuit can be brought and any existing lawsuit must stop. Will any hearing be held nearby? Yes The Arbitrator may decide that an in-person hearing is unnecessary and that he or she can resolve a Dispute based on written filings and/or a conference call. However, any in-person arbitration hearing must be held at a place reasonably convenient to you. What about appeals? Very limited Appeal rights under the FAA are very limited. The Arbitrator’s award will be final and binding. Any appropriate court may enter judgment upon the arbitrator's award. Who bears arbitration fees? Usually, we do. We will pay all filing, administrative, hearing and Arbitrator fees if you act in good faith, cannot get a waiver of such fees and ask us to pay. When will we cover your legal fees and costs? If you win If you win an arbitration, we will pay the reasonable fees and costs for your attorneys, experts and witnesses. We will also pay these amounts if required under applicable law or the administrator's rules or if payment is required to enforce this Dispute Clause. The Arbitrator shall not limit his or her award of these amounts because your Dispute is for a small amount. Will you ever owe us for arbitration or attorneys' fees? Only for bad faith The Arbitrator can require you to pay our fees if (and only if): (1) the Arbitrator finds that you have acted in bad faith (as measured by the standards set forth in Federal Rule of Civil Procedure 11(b)); and (2) this power does not make this Dispute Clause invalid. Can an award be explained? Yes A party may request details from the Arbitrator, within 14 days of the ruling. Upon such request, the Arbitrator will explain the ruling in writing. This Card is issued by MetaBank, Member FDIC, pursuant to a license from Visa U.S.A. Inc.
WHAT DOES METABANK DO WITH YOUR PERSONAL INFORMATION? What? The types of personal information we collect and share depend on the product or service you have with us. This information can include: • Social Security number and Income • Account balances and Transaction history • Credit history and Assets When you are no longer our customer, we continue to share your information as described in this notice. How? All financial companies need to share customers’ personal information to run their everyday business. In the section below, we list the reasons financial companies can share their customers’ personal information; the reasons MetaBank chooses to share; and whether you can limit this sharing. How does MetaBank protect my personal information? To protect your personal information from unauthorized access and use, we use security measures that comply with federal law. These measures include computer safeguards and secured files and buildings. How does MetaBank collect my personal information? We collect your personal information, for example when you • Open an account or Apply for a loan • Make deposits or withdrawals from your account or Provide account information • Make a wire transfer We also may collect your personal information from others, such as credit bureaus, affiliates, or other companies. Affiliates Companies related by common ownership or control. They can be financial and nonfinancial companies. • MetaBank does not share with our affiliates. Nonaffiliates Companies not related by common ownership or control. They can be financial and nonfinancial companies. • MetaBank does not share with nonaffiliates so they can market to you. Joint Marketing A formal agreement between nonaffiliated financial companies that together market financial products or services to you. • Our joint marketing partner(s) include nonaffiliated financial companies that we may partner with to jointly market financial products or services to you. Residents of California or Vermont: We will not share with nonaffiliates except for our own marketing purposes, our everyday business purposes, or with your consent. Residents of Nevada: We are providing this notice pursuant to Nevada law. WHAT DOES BLACKHAWK DO WITH YOUR PERSONAL INFORMATION? What? The types of personal information we collect and share depend on the product or service you have with us. This information can include: • Social Security number and payment history • account balances and account transactions • transaction history and purchase history When you are no longer our customer, we continue to share your information as described in this notice. How? All financial companies need to share customers’ personal information to run their everyday business. In the section below, we list the reasons financial companies can share their customers’ personal information; the reasons Blackhawk chooses to share; and whether you can limit this sharing. Who is providing this notice? Blackhawk Network California, Inc. (“Blackhawk”), which provides certain services in connection with your card account. How does Blackhawk protect my personal information? To protect your personal information from unauthorized access and use, we use security measures that comply with federal law. These measures include computer safeguards and secured files and buildings. How does Blackhawk collect my personal information? We collect your personal information, for example, when you: • open an account or provide account information • give us your contract information or show us your government‑issued ID • use your credit or debit card We also collect your personal information from others, such as credit bureaus, affiliates, or other companies. Why can’t I limit all sharing? Federal law gives you the right to limit only: • sharing for affiliates’ everyday business purposes – information about your creditworthiness • affiliates from using your information to market to you • sharing for nonaffiliates to market to you State laws and individual companies may give you additional rights to limit sharing. See below for more on your rights under state law. Nonaffiliates Companies not related by common ownership or control. They can be financial and nonfinancial companies. • Blackhawk does not share with nonaffiliates so they can market to you. Joint Marketing A formal agreement between nonaffiliated financial companies that together market financial products or services to you. • Blackhawk may partner with nonaffiliated financial companies to jointly market financial products or services to you. CA residents: Blackhawk will limit sharing with its affiliates to the extent required by California law. Blackhawk will not share your personal information for joint marketing with other financial institutions. VT residents: If Blackhawk shares your personal information for joint marketing with other financial institutions, it will share only your name, contact information, and information about your transactions. NV residents: We are providing this notice pursuant to Nevada law. Preference information such as product wish lists, order history, or marketing preferences. Sometimes, we may combine PII you provide with information from third-party sources. For example, we may confirm your address with the postal service or verify your personal information with a credit-reporting agency. We will treat the combined information in accordance with the terms of this Policy. Device and other tracking information, such as browser information, non-PII device identifiers, operating system, or information gained from cookies, pixels or other tracking technologies. OI may also include PII we have de-identified or aggregated to the point where it no longer identifies a particular individual. If we ever combine OI with any PII, we treat it as PII is treated under this Policy. In some jurisdictions, some OI may be considered PII by law. In those cases, we will treat the information as PII is treated under this Policy. We collect PII when you provide it to us. This can occur when you fill out applications, create accounts, complete a purchase, add money to your account, send in forms, take surveys, or fill in various online fields on our Sites. We also collect PII when you contact us with inquiries, customer support requests, or employment applications. We may also collect the PII of third parties when you provide it to us. For example, if you choose to use our service to send a gift to a friend or register a family member for an account, we will ask you for your their name and address or email address. In addition, we may collect third party PII through our "Refer a Friend" program. Blackhawk stores this information for the sole purpose of completing the transaction. If you provide PII of a friend or family member and they want us to delete this information, they should contact us at privacy@bhnetwork.com. We may not always be able to remove their PII. We will let them know if we cannot do so and why. For risk control, fraud detection and prevention, and compliance with laws and regulations. Blogs: Some of our Sites offer publicly accessible blogs. Any information you provide in these areas may be read, collected, and used by others who access them. To request removal of your personal information from our blog or community forum, contact us at privacy@bhnetwork.com. We may not always be able to remove your personal information. We will let you know if we cannot do so and why. Newsletters: If you subscribe to our newsletters, we will use your name and email address to send them to you. You may choose to stop receiving our newsletter or marketing emails by following the unsubscribe instructions included in these emails or accessing the email preferences in your account. Testimonials: We display personal testimonials of satisfied customers on some of our Sites and in print advertisements. With your consent, we may use your testimonial and your name. If you wish to update or delete your testimonial, you can contact us at privacy@bhnetwork.com. Geolocation: We may collect your location-based information to help you locate a store offering our products and services in your area. We will only share this information with our mapping provider for the sole purpose of providing you this service. On some Sites (for example, www.reloadit.com), we collect location-based information for fraud prevention purposes. You may opt out of location-based services at any time by changing the settings on your device. If you do, you might not be able to use certain features, especially when we use location-based information to prevent fraud. Affiliates: To the extent permitted by law, we may provide information about your transactions and experiences with other affiliated Blackhawk entities, including parent companies and subsidiaries. Service providers: We may provide your PII to companies that provide services to help us with our business activities, such as shipping your order or offering customer service. These companies are authorized to use your PII only as necessary to provide these services. Product short notices: Some products offered in conjunction with banks have unique data sharing agreements. Blackhawk will make available short privacy notices of each product’s sharing policies on its website. Log files: Most browsers collect certain information, such as your IP address, device type, screen resolution, operating system version, and internet browser type and version. This information is gathered automatically and stored in log files. We may link this data to PII we have collected about you. You can refuse to accept cookies. Most devices and browsers offer their own privacy settings for cookies and HTML5 local storage. You will need to manage your cookie settings for each device and browser you use. However, if you elect not to accept cookies, your use of the features on our Sites may be limited or impaired, and you may not be able to access certain features of our Sites at all. Advertising: We partner with a third party to manage our advertising on other sites. Our third party partner may use technologies such as cookies to gather information about your activities on this website and other sites in order to provide you advertising based upon your browsing activities and interests. If you wish to not have this information used for the purpose of serving you interest-based ads, you may opt-out by clicking here. If you are located in the European Union, click here. Please note this does not opt you out of being served ads. You will continue to receive generic ads. Social Media Widgets: Our Sites include social media features, such as the Facebook "Like" button. These features may collect your IP address, identify the page you are visiting on our website, and set a cookie to enable the feature to function properly. Social Media Widgets are either hosted by a third party or hosted directly on our website. The privacy statement of the company providing it governs your interactions with these Widgets. We will comply with any legal obligations placed on the use of these technologies by certain jurisdictions, which may affect how these Widgets function. Some of our websites offer you the ability to upload your own image to be used to create a personalized product. You may have the option to make these images available in publicly-accessible directories. You should be aware that any information you provide in these areas may be read, collected and used by others who access them. To request removal of your personal information from these public forums, please email us at privacy@bhnetwork.com or contact us by postal mail at the contact information listed below. In some cases, we may not be able to remove your personal information, in which case we will let you know if we are unable to do so and why. Upon request Blackhawk will provide you with information about whether we hold any of your personal information. You may access, correct, update, amend, remove, ask to have it removed from a public forum, directory or testimonial on our site or deactivate it by making the change on your account page, emailing us at privacy@bhnetwork.com or by contacting us by postal mail at the contact information listed below. We will respond to your request within a reasonable time. Blackhawk acknowledges that you have the right to access your personal information. Blackhawk may have no direct relationship with some individuals whose personal data it processes. In those situations, an individual who seeks access, or who seeks to correct, amend, or delete inaccurate data, should direct their query to Blackhawk’s partner who has the direct relationship (the data controller). If requested to remove data we will respond within a reasonable timeframe. Many browsers provide you an option to request that a web application disable either its tracking and/or cross site user tracking of an individual user. We do not track your online activities across different Sites, and we only track your activity within a Site to the extent you log into your account. Therefore, our practices remain the same whether or not you enable the "Do Not Track" feature. Our Sites are not directed to individuals under the age of thirteen (13), and we request that such individuals do not provide PII through our Sites. We do not knowingly collect information from children under 13. If you live in the European Economic Area ("EEA") or in Canada, the data that we collect from you may be transferred to and stored at a location outside the EEA and Canada. It may also be processed by staff operating outside the EEA and Canada who work for us or for one of our service providers. Among other things, such staff may process and store your information and provide support services. By submitting your personal data, you agree to this transfer, storing or processing. We will ensure that your data is treated securely and in accordance with this Policy. Blackhawk is responsible for the processing of personal data it receives, under the Privacy Shield Framework, and subsequently transfers to a third party acting as an agent on its behalf. Blackhawk complies with the Privacy Shield Principles for all onward transfers of personal data from the EU, including the onward transfer liability provisions. With respect to personal data received or transferred pursuant to the Privacy Shield Framework, Blackhawk is subject to the regulatory enforcement powers of the U.S. Federal Trade Commission. In certain situations, Blackhawk may be required to disclose personal data in response to lawful requests by public authorities, including to meet national security or law enforcement requirements. This Policy is subject to change. Please review it from time to time. If we make changes, we will revise the "Late Updated" date at the top. Any changes will become effective when we post the revised Policy. If we make any material changes, we will notify you by email or by means of a notice on this Site prior to the change becoming effective. Your edit the invitation however you like, we send it to everyone in your group. We automatically send a reminder to everyone 3 days after your gift launches. We send an additional reminder to everyone in your group that has not yet chipped in if your collection period is longer than 10 days. 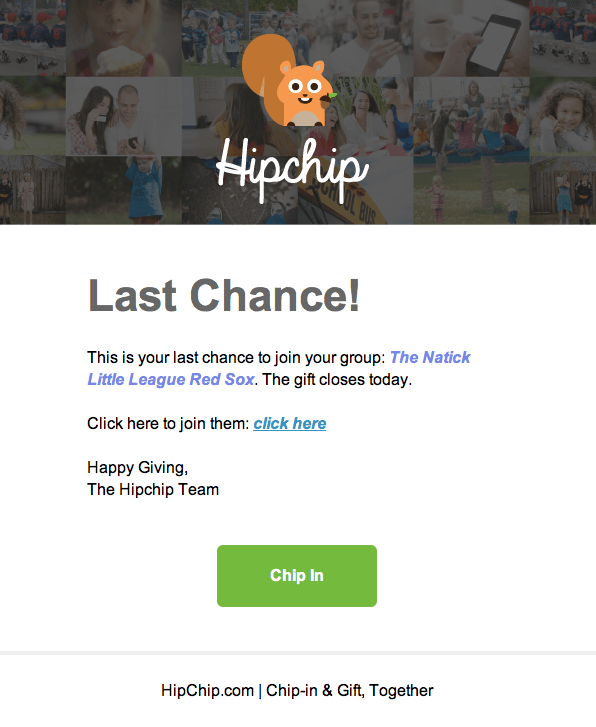 We send one final reminder to all the latecomers the day before your gift pool is set to close out. Welcome to HipChip.com! These Terms of Service (Terms) contain important information regarding your rights, obligations and restrictions in connection with your use of our website at www.hipchip.com (Website) and/or use our applications and services (collectively, Services). As used in these Terms, the terms "HipChip", "we", "us", "our" and the like refer to HipChip, Inc., a Delaware corporation, and the terms "you", "your" and the like refer to you, the end-user of our Website and Services. These Terms apply to all HipChip applications and services used by you whether your use is on a computer, mobile device, tablet or other platform. THESE TERMS ARE A BINDING AGREEMENT BETWEEN YOU AND HIPCHIP. BY ACCESSING, VISITING OR USING THE WEBSITE YOU ACCEPT AND AGREE TO BE BOUND BY THESE TERMS, WHETHER OR NOT YOU REGISTER AN ACCOUNT WITH HIPCHIP. IF YOU DO NOT AGREE TO THESE TERMS, YOU MAY NOT USE OUR WEBSITE OR SERVICES. We may from time to time add, change or discontinue any products or services that comprise our Services. We reserve the right to do so at any time, in our sole discretion. Some changes in Services will also be accompanied to changes to these Terms. In addition, some services we may offer may be subject to additional terms and conditions that we may publish from time to time. Your use of any such services is subject to those additional terms and conditions, which are incorporated by reference into these Terms. To use the Services to initiate a gift transaction (Gift), as the organizer of Gift (Organizer), you will be required to take certain steps. These steps will include, without limitation, the following: (i) register an account with HipChip (see Registration below), (ii) select the Gift item you would like to purchase from the list of available items, (iii) provide the names and email addresses of your friends and others that you would like to participate as contributors (each, a Contributor) and the recommended amount of each contribution, and (iv) provide the name and email address for the Gift recipient(s) (each, a Recipient), and (v) check out and make payment via our on the Website for your portion of the Gift amount. Once a Gift has been created, we will contact all of the Contributors for that Gift to inform them that they have been invited to participate in the Gift as set up by the Organizer. Each Contributor will then be given the opportunity to pay for their suggested contribution amount. Participating as a Contributor is completely voluntary. We are not responsible for any failure to participate for the full recommended amount or at all. We will make reasonable attempts to contact each Contributor but if a Contributor fails to act or otherwise respond, the Contributor will be excluded from contributing to the Gift. Please note that if the total actual contribution for a Gift is less than the minimum amount required for the Gift, then the Gift will not be issued and the Organizer will be notified and can choose to change or cancel the gift. If the gift is canceled, the contributions will be refunded. Each Contributor who participates in a Gift agrees that we may use their email address or other contact information provided by the Organizer to contact them for promotional or Service-related purposes. When all of the requirements for making the contributions have been met, we will complete the transaction and deliver the Gift. Once a payment has been processed, that transaction is final. There is no right to any returns, refunds and cancellations of any transactions. The purchase and receipt of a Gift provides only a right to redeem the Gift with the Merchant, in accordance with the terms for such Gift set by such Merchant. All Gifts must be redeemed with that particular Merchant. The Merchants are the issuers of the Gifts and the sellers of the products or services for which Gifts can be redeemed. We are not responsible for any problems any person may experience in redeeming any Gift with a Merchant, or with respect to any products or services that MAY be purchased from a Merchant using the Gift or otherwise. We are not responsible for any Merchant's failure to honor any Gift, including any failure that results from any bankruptcy or insolvency of any Merchant. 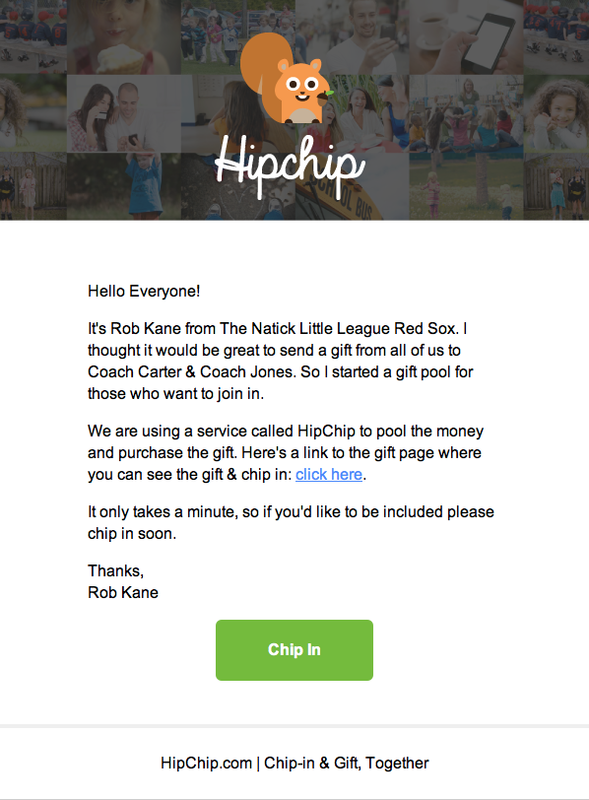 Each Organizer, Contributor and Recipient hereby agrees to indemnify and hold harmless the HipChip Indemnitees (as defined below) from any claim or damage that any such person may have arising from any Gift or any products or services that such person may purchase, or attempt to purchase, using such Gift. Gift Organizers, Contributors and Recipients may be subject to laws, regulations, ethical policies, codes of conduct and other similar legal and contractual obligations and rules that may restrict and limit the type and value of gifts or other benefits or perquisites that such persons may receive. We are not responsible, and will not be held liable, for any violation that may occur as a result of a Gift using the Services. It is the responsibility of the Organizers, Contributors and Recipients to verify such information and laws, rules and regulations for each Gift and to comply with such laws, rules and regulations. While we hope this does not happen often or ever, it is also possible that a mistake, inaccuracy or omission (each, a mistake) on our Website or Services occurs from time to time, where the Gift product is not completely or correctly described or is incorrectly processed. We will use our reasonable efforts to correct a mistake as soon as practicable after we discover it or it is brought to our attention. We also reserve the right at any time to correct any mistake, and change the prices, content, promotion offers, product descriptions or specifications, or other information without obligation to issue any notice of such changes (including after Gift has already been processed, except as otherwise prohibited by applicable law). We apologize in advance for any inconvenience that this may cause you. You expressly acknowledge this limitation of liability and agree to indemnify and hold harmless the HipChip Indemnitees (as defined below) from any claim or damage that you or any other person may have arising from any such mistake. As a condition of your use of the Website and Services, you represent, warrant and agree that you are at least 18 years old, you have the authority to create a binding legal obligation, and that your use of the Website and Services will at all times comply with these Terms. You may only create one account per person. Your use of the Website and Services is for personal purposes only. You may not use the Website in the conduct of your business, for the promotion, distribution or sale of any products or services, or in violation of any applicable laws, regulations, rules or ordinances, including those relating to gift restrictions, charitable donations or political contributions. We reserved the right, at any time, in our sole discretion, to refuse to offer the Services to any person or entity and change our eligibility criteria for use of our Services. We may also revoke or suspend your right to use and/or access the Website and Services, at any time without notification or liability to you or any other person, and for any reason or for no reason at all. This provision is void where prohibited by law. 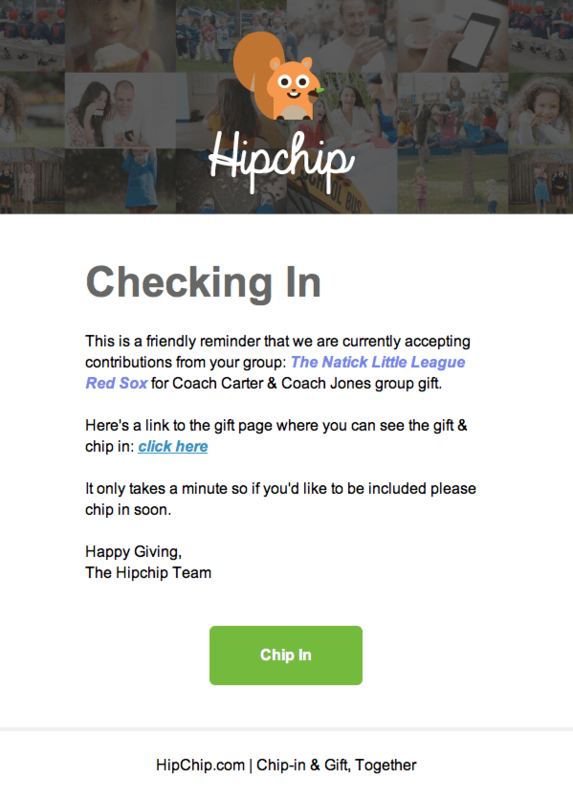 To initiate a Gift transaction, you must first register an account with HipChip. During the registration process, you will be required to provide certain information, including a user name, a password and a valid email address (Registration Data). You agree to provide accurate Registration Data and to update your Registration Data as necessary to keep it accurate. You may not impersonate, imitate or pretend to be somebody else when registering and/or setting up an account with us. We reserve the right to delete accounts created by users who appropriate the name, likeness, e-mail address, or other personally identifiable information of another individual. You are responsible for maintaining the confidentiality and security of your account. You may change your password at any time by updating your account on our Website. You must notify us immediately of any unauthorized use of your password and/or account. We are not responsible for any losses arising out of the unauthorized use of any of your Registration Data. We also are not responsible for the security of any information that you choose to provide to us, including any credit card or other payment information, while the information is being transmitted or for any data lost during such transmission. You agree to indemnify and hold harmless HipChip Indemnitees, its partners, parents, subsidiaries, agents, affiliates and/or licensors, as applicable, for any improper, unauthorized or illegal uses of your Registration Data. Our Website may contain links to other websites or resources on the Internet, and other websites or resources may contain links to our Website. When you access third party websites, you do so at your own risk. We are not responsible for and do not endorse any such third-party content or services. These other websites are not under our control. You acknowledge that we are not liable for the content, functions, accuracy, legality, appropriateness or any other aspect of such websites or resources. delete, obscure, or in any manner alter any warning, notice (including but not limited to any copyright or other proprietary rights notice), or link that appears in Website or by way of the Services. You may not interfere or attempt to interfere with the operation of the Website or Services in any way through any means, software, routine or device including, but not limited to, spamming, hacking, uploading computer viruses, or the means expressly prohibited by any provision of these terms and conditions of use. You may not deep-link to this Website for any purpose or access this Website with any robot, spider, web crawler, extraction software, or any other automated process or device to scrape, copy, or monitor any portion of this Website or any information, content, or material on this Website. You may not link or frame to any pages of this Website or any content contained therein, whether in whole or in part. We reserve all statutory and common law rights against any person or entity who violates this paragraph. THE WEBSITE AND ALL SERVICES ARE PROVIDED ON AN "AS IS" AND "AS AVAILABLE" BASIS WITHOUT WARRANTIES OF ANY KIND, EITHER EXPRESS OR IMPLIED, INCLUDING BUT NOT LIMITED TO WARRANTIES OF MERCHANTABILITY, FITNESS FOR A PARTICULAR PURPOSE, OR NON-INFRINGEMENT. NEITHER THESE TERMS NOR ANY OTHER DOCUMENT INCORPORATED BY REFERENCE HEREIN NOR ANY DOCUMENTATION FURNISHED UNDER ANY OF THEM ARE INTENDED TO EXPRESS OR IMPLY ANY WARRANTY THAT THE SERVICE WILL BE UNINTERRUPTED, TIMELY, SECURE OR ERROR-FREE. WITHOUT LIMITATION, WE MAKE NO WARRANTY THAT THE WEBSITE OR ANY SERVICES WILL MEET YOUR REQUIREMENTS, THAT THE RESULTS THAT MAY BE OBTAINED FROM THE USE OF THE WEBSITE WILL BE ACCURATE OR RELIABLE, THAT THE QUALITY OF ANY SERVICES, INFORMATION OR OTHER MATERIAL PURCHASED OR OBTAINED BY YOU THROUGH HIPCHIP WILL MEET YOUR EXPECTATIONS; AND THAT ANY ERRORS IN THE SOFTWARE WILL BE CORRECTED. ANY MATERIAL DOWNLOADED OR OTHERWISE OBTAINED THROUGH THE USE OF THE WEBSITE IS ACCESSED AT YOUR OWN DISCRETION AND RISK, AND YOU WILL BE SOLELY RESPONSIBLE FOR ANY DAMAGE TO YOUR COMPUTER SYSTEM OR LOSS OF DATA THAT RESULTS FROM THE DOWNLOAD OF ANY SUCH MATERIAL. NO ADVICE OR INFORMATION, WHETHER ORAL OR WRITTEN, OBTAINED BY YOU FROM HIPCHIP OR THROUGH OR FROM THE WEBSITE SHALL CREATE ANY WARRANTY NOT EXPRESSLY STATED IN THE TERMS. IN NO EVENT SHALL ANY HIPCHIP INDEMNITEE BE LIABLE FOR ANY DAMAGES WHATSOEVER (INCLUDING, WITHOUT LIMITATION, INCIDENTAL, CONSEQUENTIAL, DIRECT OR INDIRECT DAMAGES, EXPECTATION DAMAGES, PUNITIVE DAMAGES, LOST PROFITS, OR OTHER SIMILAR DAMAGES) RESULTING OUT OF, OR IN ANY WAY CONNECTED WITH YOUR USE OF THE WEBSITE, THE SERVICES OR ANY TRANSACTION CONDUCTED WITH ANY MERCHANT, OR ANY UNAUTHORIZED ACCESS BY A THIRD PARTY OF YOUR PERSONAL INFORMATION, WHETHER SUCH CLAIMS MAY BE BASED ON WARRANTY, CONTRACT, TORT, OR ANY OTHER LEGAL THEORY, AND WHETHER OR NOT WE ARE ADVISED OF THE POSSIBILITY OF SUCH DAMAGES. WITHOUT LIMITING THE FOREGOING, IF WE ARE FOUND TO BE LIABLE TO YOU FOR LOSSES ARISING OUT OF YOUR TRANSACTIONS WITH A MERCHANT, OR OTHERWISE, YOU AGREE THAT OUR AGGREGATE LIABILITY TO YOU OR TO ANY THIRD PARTY IS LIMITED TO $50.00 IN TOTAL, REGARDLESS OF THE NUMBER OF TRANSACTIONS, OCCURRENCES OR CLAIMS. FURTHERMORE, YOU AGREE THAT ANY CAUSE OF ACTION THAT YOU MAY BRING ARISING OUT OF OR RELATING TO THE WEBSITE OR THE SERVICES MUST BE COMMENCED NOT LATER THAN SIX (6) MONTHS FROM THE DATE THAT SUCH CAUSE OF ACTION AROSE, AND THE FAILURE TO COMMENCE AN ACTION WITHIN SUCH PERIOD WILL MEAN THAT THE ACTION SHALL BE PERMANENTLY BARRED. YOU AGREE THAT THESE LIMITATIONS OF LIABILITY ARE AN ESSENTIAL CONDITION TO THE AGREEMENT BETWEEN HIPCHIP AND YOU, WITHOUT WHICH HIPCHIP WOULD NOT HAVE AGREED TO ALLOW YOU TO ACCESS OUR WEBSITE OR USE OUR SERVICES. To the extent that jurisdiction applicable to you does not permit the disclaimer of warranties, exclusion of damages and other limitations in this paragraph, and the foregoing disclaimers, exclusions and limitations may not apply to you to such extent. ou agree to indemnify, defend, and hold harmless HipChip, its partners, parents, subsidiaries, agents, affiliates and/or licensors, and their respective officers, directors, shareholders, employees and agents (the HipChip Indemnitees) from any claim or demand, including reasonable attorneys' fees, made by any third party due to or arising out of: (a) your use of the Services; (b) any alleged violation of these Terms or any other document incorporated by reference herein, including any fraud, abuse of the Services or any transactions that we determine not to be made on a bona-fide basis; (c) any alleged violation of any rights of others arising from or related to the Service (including without limitation, any claim breach of confidentiality, privacy violation, false or deceptive advertising or sales practices); (d) any unlawful act, intentional misconduct or negligence by you. HipChip shall have the right to control the defense of any matter subject to indemnification under these Terms. We may modify these Terms from time to time in our sole discretion and without prior notice to you. Any modification of these Terms will be posted on the Website. The modified Terms will become effective upon such posting. Your continued use of the Website and Services after posting of the amended Terms indicates your acceptance of and agreement to be bound by the amended Terms. If you do not agree to a modification, you should stop visiting HipChip.com immediately. These Terms and the relationship between you and HipChip are governed by the laws of the Commonwealth of Massachusetts without regard to its conflict of law provisions. WE WILL MAKE EVERY REASONABLE EFFORT TO RESOLVE ANY DISAGREEMENTS THAT YOU HAVE WITH US. IF THOSE EFFORTS FAIL, AS A CONDITION TO USING THE WEBSITE AND THE SERVICES, YOU AGREE THAT ANY CLAIM, DISPUTE, OR CONTROVERSY YOU MAY HAVE AGAINST THE INDEMNIFIED PARTIES (AS DEFINED ABOVE), AND ANY CAUSE OF ACTION THAT YOU MAY BRING IN CONNECTION WITH SUCH CLAIM, DISPUTE OR CONTROVERSY, ARISING OUT OF, RELATING TO, OR CONNECTED IN ANY WAY WITH THESE TERMS, THE WEBSITE OR THE SERVICES, SHALL BE RESOLVED EXCLUSIVELY BY FINAL AND BINDING ARBITRATION ADMINISTERED BY THE AMERICAN ARBITRATION ASSOCIATION ("AAA") AND CONDUCTED BEFORE A SINGLE ARBITRATOR PURSUANT TO THE APPLICABLE RULES AND PROCEDURES ESTABLISHED BY AAA ("RULES AND PROCEDURES"). YOU AGREE FURTHER THAT: (A) THE ARBITRATION SHALL BE HELD AT A LOCATION DETERMINED BY AAA PURSUANT TO THE RULES AND PROCEDURES (PROVIDED THAT SUCH LOCATION IS REASONABLY CONVENIENT FOR YOU), OR AT SUCH OTHER LOCATION AS MAY BE MUTUALLY AGREED UPON BY YOU AND HIPCHIP; (B) THE ARBITRATOR SHALL APPLY MASSACHUSETTS LAW CONSISTENT WITH THE FEDERAL ARBITRATION ACT AND APPLICABLE STATUTES OF LIMITATIONS, AND SHALL HONOR CLAIMS OF PRIVILEGE RECOGNIZED AT LAW; (C) THERE SHALL BE NO AUTHORITY FOR ANY CLAIMS TO BE ARBITRATED ON A CLASS OR REPRESENTATIVE BASIS; ARBITRATION CAN DECIDE ONLY YOUR AND/OR HIPCHIP'S INDIVIDUAL CLAIMS; AND THE ARBITRATOR MAY NOT CONSOLIDATE OR JOIN THE CLAIMS OF OTHER PERSONS OR PARTIES WHO MAY BE SIMILARLY SITUATED; (D) IN THE EVENT THAT YOU ARE ABLE TO DEMONSTRATE THAT THE COSTS OF ARBITRATION WILL BE PROHIBITIVE AS COMPARED TO THE COSTS OF LITIGATION, HIPCHIP WILL AGREE TO PAY AS MUCH OF YOUR FILING AND HEARING FEES IN CONNECTION WITH THE ARBITRATION AS THE ARBITRATOR DEEMS NECESSARY TO PREVENT THE ARBITRATION FROM BEING COST-PROHIBITIVE; AND (E) WITH THE EXCEPTION OF SUBPART (C) ABOVE, IF ANY PART OF THIS ARBITRATION PROVISION IS DEEMED TO BE INVALID, UNENFORCEABLE OR ILLEGAL, OR OTHERWISE CONFLICTS WITH THE RULES AND PROCEDURES ESTABLISHED BY AAA, THEN THE BALANCE OF THIS ARBITRATION PROVISION SHALL REMAIN IN EFFECT AND SHALL BE CONSTRUED IN ACCORDANCE WITH ITS TERMS AS IF THE INVALID, UNENFORCEABLE, ILLEGAL OR CONFLICTING PROVISION WERE NOT CONTAINED HEREIN. IF, HOWEVER, SUBPART (C) IS FOUND TO BE INVALID, UNENFORCEABLE OR ILLEGAL, THEN THE ENTIRETY OF THIS ARBITRATION PROVISION SHALL BE NULL AND VOID, AND NEITHER YOU NOR HIPCHIP SHALL BE ENTITLED TO ARBITRATE THEIR DISPUTE AND HIPCHIP SHALL NOT BE OBLIGATED FOR ANY COSTS DESCRIBED IN SUBPART (D). We will not be responsible for any failure or delay in performance due to circumstances beyond its reasonable control, including, without limitation, acts of god, war, riot, embargoes, acts of civil or military authorities, fire, floods, accidents, service outages resulting from equipment and/or software failure and/or telecommunications failures, power failures, network failures, failures of third party service providers (including providers of internet services and telecommunications). We are not responsible for any use of the Services that is in violation any applicable law, rule or regulation, constitutes fraud or other similar conduct, or is otherwise not a bona-fide good faith use of the Services. Our failure to exercise or enforce any right or provision of these will not constitute a waiver of such right or provision. If any provision of these Terms is found by a court of competent jurisdiction to be invalid, the parties nevertheless agree that the court should endeavor to give effect to the parties' intentions as reflected in the provision, and agree that the other provisions of these Terms remain in full force and effect. All communications between you and HipChip will be done electronically. By providing us with your email address, you agree to receive communications from us in electronic form and that all terms and conditions, agreements, notices, disclosures and other communications that we provide to you electronically satisfy any legal requirement that such communications be made in writing. Copyright © 2013 HipChip, Inc. All Rights Reserved. By using or accessing the Website or the Services, you acknowledge and accept the practices described in this Policy. We reserve the right to change this Policy from time to time. Your continued use of the Website or Services constitutes your acceptance of the Policy then in effect. For this reason, you should review the Policy from time to time to ensure that you understand and are willing to accept our current privacy practices. If you have questions or concerns regarding this Policy, please contact us at by email at info@hipchip.com. This Policy covers user-submitted information, including your name, email address, gifts you send and receive, users you interact with, and other data you generate while using the Website. It also covers data that we access and may store with your permission from third party applications such as Facebook in order to enhance your experience, including your basic profile information, friend data, and other social data. Finally, it covers information that we gather automatically when you use the Website, including your IP address, browser type, cookie information, and browsing patterns. We collect the following types of information in connection with our Services. General. When you sign up for our Services, you will be required to create an account, which requires you to provide your full name and a valid email address. We will use this information to contact you as part of the transaction process, to send you periodic emails for which you have signed up, or for purposes that are intended to enhance your user experience. When you use our Services to purchase gifts for others, you will be asked to provide the names and/or email addresses for your friends and contacts who will be purchasing this gift with you. We will also ask you for the name and email address of the gift recipient(s). We will use this personal information to help users organize, invite, donate, track, and acknowledge contributions, as well as to enable transactions to be completed. When signing up for our mailing lists or other services or promotions that require registration, you may also be asked to provide your name at that time so that we can personalize the communications you receive from us. We will occasionally collect demographic data, such as zip code, gender, and occupation to provide you with a better experience and to improve the quality of our services. Financial Information. To process a gifting transaction with our Services, you will be required to provide credit card or other payment account information, which is maintained by our payment processor and designated third party service providers. We do not share this information with any third party except the companies responsible for processing our credit card transactions. Our third party service providers are responsible for the handling of all such information that you submit. Log Data. When you visit our Website, whether as a registered user or a non-registered user, our servers automatically record information that your browser sends whenever you visit any website. This log data may include information such as the date and time of your visits, your IP address, the name of your ISP, your browser type, the webpage you were visiting before you came to our Website, the pages of our Website that you visit, the time you spent on those pages, any searches that you conduct on our Website, access times and dates, and other statistics. We may use this information to monitor and analyze use of the Website, to administer Website, to test and enhance our Services. We do not aggregate this information with any personal information that you submit, but we may aggregate, analyze and evaluate such information on an anonymous basis. To develop, offer and deliver our products and services, to offer products and services of our corporate affiliates, merchant partners, and other companies, and to comply with legal and regulatory requirements, including any investigations, subpoenas and other legal processes. To notify you via email about special offers or other products and services that may be of interest to you. We may also contact you and deliver information to you that may be targeted to your interests, such as targeted banner advertisements, and product offering communications. You will always be able to decline any or all of these communications by following the directions included in our emails or other communications. If we enter into a merger, acquisition, reorganization or sale of assets or in the event of bankruptcy, we may sell, transfer, assign or license some or all of our assets to a third party, which assets may include your personal information that we have collected. Our Website contains links to other websites operated by third parties. If you choose to visit an advertiser by "clicking on" a banner ad or other type of advertisement, or click on another third party link, you will be directed to that third party's website. The fact that we link to a website or present a banner ad or other type of advertisement is not an endorsement, authorization or representation of our affiliation with that third party, nor is it an endorsement of their privacy or information security policies or practices. We do not exercise control over third party websites. These other websites may place their own cookies or other files on your computer, collect data or solicit personal information from you. Other sites follow different rules regarding the use or disclosure of the personal information you submit to them. You are responsible for reading and understanding the privacy policies or statements of the other websites you visit. In compliance with the Children's Online Privacy Protection Act (COPPA), we will not knowingly provide access to our Website or Services to, or collect any personally identifiable information from, persons under the age of thirteen (13). If you are under the age of 13, you may not register an account with us. If we learn that a user is under the age of thirteen (13), we will take appropriate steps to remove the user's information from the database and restrict the individual from future access our Services. We take precautions - including technical, administrative and physical measures - to safeguard your information. We use technical safeguards such as firewalls and data encryption. Your account information including email address is located on a secured server behind a firewall. We authorize access to personally identifiable information, including email addresses, only for those employees, contractors and agents who need to know that information in order to operate, develop or improve our services. These individuals are bound by confidentiality obligations and may be subject to discipline, including termination and criminal prosecution, if they fail to meet these obligations. We also enforce physical access controls to our buildings and files. You may review, update, correct or delete any personal information in your account with us by editing your profile on the Website or by emailing us a written request to do so. If you completely delete all such information, then your account may become deactivated. We will use commercially reasonable efforts to honor your request. We may retain an archived copy of your records. HipChip may update this Policy at any time. The latest version of this Policy will always be available at http://www.hipchip.com/privacy. Please check this page occasionally to make sure you are aware of any updates.